Have testing regimes in standards got out of touch with reality? First of all, don’t misunderstand my objective here. I think better regulation of fire industry construction products is a good thing. A standard that requires relevant testing of fire safety products is of absolute benefit – providing the testing requirements are based on empirical evidence of the products in fire situations. Testing is good – but are all testing regimes relevant and justified? A number of recent standards appear to have gone overboard with the testing regime being required, leading to enormous cost for manufacturers, which in turn will lead to increased costs for the supply chain, with little or no tangible benefit to the end user. I firmly believe that if a new standard requires a manufacturer to carry out testing on the product, that the testing should be relevant and justified. There needs to be evidence as well as a clear and reasonable justification. Otherwise a cynical person might think that the additional testing has been introduced either to limit the market for one or two manufacturers or to line the pockets of the testing bodies, or both. An example of this is the recent British Standard for Fire Curtains, BS 8524-1 “Active fire curtain barrier assemblies – Part 1: Specification”. 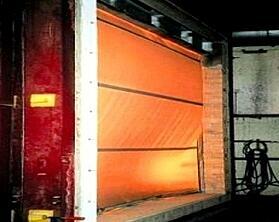 Some of the fire curtain performance tests set out in this standard are simply not realistic. Of course the basic requirements must be met, the curtain must prevent fire spread, it should descend at a controlled rate to prevent harm and it should be lifecycle tested to demonstrate continued operation post installation. However, some of the testing in the standard is extraordinary: it bears no resemblance to the functional requirements of the application and there is no justification based on evidence of failure in a fire incident, or otherwise. Impact testing is a good example of this, so let’s have a look at the requirement. Briefly, the standard states that the fire curtain assembly should be tested for large soft body impact and crowd pressure in accordance with BS 5234-2, having a pendulum drop height set at double that specified for the severe duty (SD) level. The assembly shall remain operable afterwards, and gaps shall not develop between the fabric and beyond the retention device (i.e. side guides). The standard states that following the initial impact test, the barrier assembly shall undergo testing for reliability and durability. A second impact test shall then be undertaken on the same barrier assembly and the barrier assembly shall remain operable afterwards. Severe duty (SD) is defined in BS5234-2 for use when the adjacent space is “intensively used by the public and others with little incentive to exercise care. Prone to vandalism and abnormally rough use” Examples cited are major circulation or heavy industrial areas. If a movable fire shutter is installed in a wall, it simply has to meet a set level of fire resistance. By contrast, if a fabric fire curtain is used, then it would appear that it needs to withstand an additional level of testing, which is quite out of proportion to how the fire curtain is expected to be used, in three respects. Why is the duty set at “severe” – surely the severity of the impact test should be tailored for the application? Why is the pendulum drop height set at double that specified for the severe duty (SD) level? How has this been justified? Is there a trend in fire curtain installations that shows that they are failing in fires due to experiencing a particularly severe impact? I doubt it. Why is the lifecycle test carried out after the impact test? This implies that potential damage to the curtain can/should be ignored. In my opinion, if the curtain is damaged, it should be replaced, not left in situ to potentially fail in the event of a fire - you wouldn’t risk driving a car after a severe impact without getting it checked out first (let alone crashing it twice!) and I see no reason why it should be any different for a fire curtain. Conor Logan is a Technical Manager of Colt UK, Smoke and Climate Control Division. Conor designs innovative smoke control and HVAC systems and is also Chairman of the Smoke Control Association.